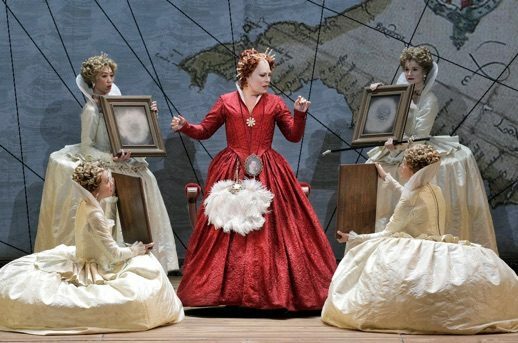 For this last opera of the so-called “Tudor Trilogy,” SFO spared no expense in assembling the world’s best bel canto singers to bring the tragedy to life. And what a mighty cast it was indeed, with the three acclaimed principals of 2014’s Norma returning for another triumph of bel canto. 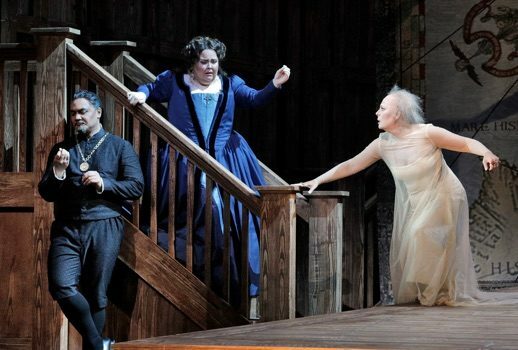 No performance of Roberto Devereux is complete without a towering Elisabetta, and on Saturday night, soprano Sondra Radvanovsky totally owned the stage. She was everything; powerful yet expressive, domineering yet anxious, jealous yet caring. She completely lost herself in the role. 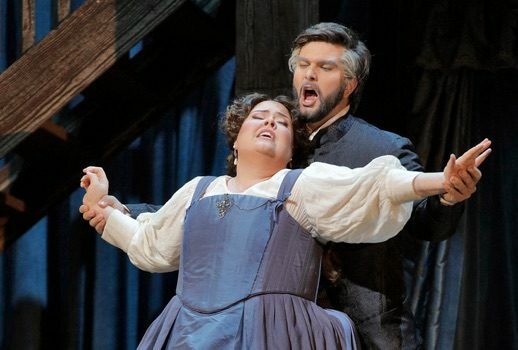 I did see her as Elisabetta when the Met opera presented Roberto Devereux two years ago, and I felt that her characterization on Saturday was fuller and more alive compared to back then. What captivated me the most was her mannerisms; she truly embodied an old queen; eccentric yet super powerful. You could not take your eyes off her every time she was on the stage. I have always thought Radvanovsky had a metallic quality to her voice, and this time, it worked to her advantage. She jumped headlong into the score with no tentativeness whatsoever. By the time she reached the difficult rondo finale, “”Vivi, ingrato, a lei d’accanto… Quel sangue versato” she was so gripping that the house was completely silent, as if everybody was holding their breath. And she knew it too! She smiled so wide and looked so relieved during the long standing ovation at the end, not unlike a person who just won a marathon! It was totally mesmerizing to watch! Radvanovsky was duly supported by the other two leading singers, mezzo-soprano Jamie Barton and tenor Russell Thomas. They both gave extraordinary performances last Saturday. Fresh from winning performances as Fricka and Waltraute during last summer’s Ring, Barton proved herself one of opera’s great chameleons. Is there anything she can’t sing? With her velvety voice, she sailed through the arias and duets. I loved her proclamation of her status as Elisabetta’s rival; it was particularly dramatic and full of suspense. Equally impressive was her duet with Nottingham at the start of Act 3; chilling and heartbreaking at the same time. Thomas made the difficult title role sound like a child’s play and he imbued his performance with swagger and confidence. He seemed almost cocky. His Roberto wasn’t a wimpy one, and that made his bewilderment at the Tower Scene more pronounced. That Tower Scene was a sight to behold; made even more significant with the appearance of metal grille surrounding him, which only appeared for that scene. 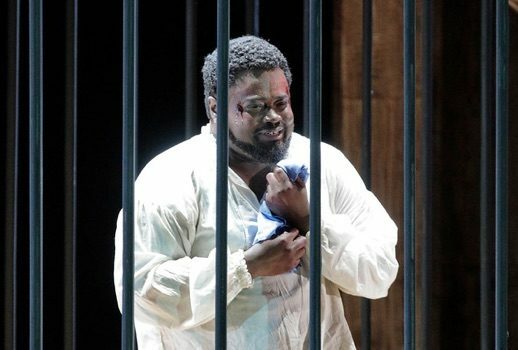 I was a little disappointed when Polish baritone Artur Rucinski withdrew because of injury about a month, as I was looking forward to his Nottingham, but second-year Adler Fellow Andrew Manea made a worthy replacement. I thought he started a bit tentatively, but he gained strength as the opera progressed. The aforementioned duet with Sara at Act 3 found him at his best, icy and vengeful. The supporting roles were handled efficiently by Adler Fellows Amitai Pati and Christian Pursell. Pati’s Lord Cecil was portrayed as truly evil, particularly during the chorus that opened Act 2, as he was shown to force fellow Royal Council members to sign Roberto’s death warrant, even threatened them with violence. It was a curious dramatic choice, in my opinion. Conductor Riccardo Frizza led the SFO Orchestra in a finely-paced reading, and he supported the singers well. None of the arias and duets felt rushed or dragged. I particularly enjoyed the Sinfonia that was shaped distinctively and dramatic, brought out the “God Save the Queen” reference. Above all, I loved the production by Stephen Lawless. The staging, which he created for Dallas Opera in 2009, and more significantly he revived for Canadian Opera Company in 2014 (also starring Radvanovsky), was simple, quiet, yet very effective in my opinion. …in one performing space, namely the Globe Theatre. The operas mirror the Shakespearean idea of the monarch being like an actor on a stage, each having to perform before an audience and each having both public and private personas…. We have tried to create a narrative between the factual and the fictional, between the 16th and 19th centuries, with the chorus acting as spectators to history. The late set designer Benoît Dugardyn created a detailed replica of the Globe Theatre as the background for the stage, complete with the two-tier of gallery levels, where the chorus stood as spectators as Lawless mentioned. A red velvet drape with gold pleats acted as the curtain for the acts, and The Great Hall at Westminster was marked with a backdrop of giant map of England, replaced with light blue curtain to identify Sara’s place at Nottingham House. It was like a lesson in how to achieve the most with as little resources as possible! Costumes by Ingeborg Bernerth were handsomely Elizabethan, although I found it odd that Sara’s dress, in a striking shade of blue silk, was a different style from the rest of the ladies’ wardrobe. What really worked for me was the tableau that unfolded during the Sinfonia; a view that I knew wasn’t shared with many reviewers of the Toronto production. It started with the old queen coming upon figurines of Henry VIII and Anne Boleyn and little Elisabetta in giant diorama display cases. Then both Henry VIII and Anne disappeared into the background leaving little Elisabetta by herself. Highlights of Elisabetta’s life followed suit, including a re-enactment of the destruction of the Armada! In similar fashion, diorama cases made a return appearance at the end with the headless torsos of (what I assumed) Mary Stuart, Anne Boleyn and Roberto Devereux, culminated with Elisabetta herself entering an empty case, a move that I interpreted to symbolize that in the end, Elisabetta herself became one of the victims. All in all, this was a perfect opera night for me, Shakespearean in stature with a cast that would be very hard to beat, and I am certain I will be making at least one return trip to the War Memorial before this run is over.